How Many Apples Do You Have - Something New Everyday! A teacher teaching Maths to seven-year-old Laiq asked him, "If I give you one apple and one apple and one apple, how many apples will you have? "Within a few seconds Laiq replied confidently, "Four!" The dismayed teacher was expecting an effortless correct answer (three). She was disappointed. "Maybe the child did not listen properly," she thought. She repeated, "Laiq, listen carefully. 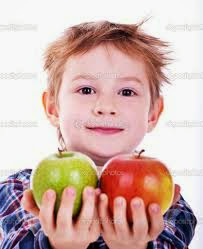 If I give you one apple and one apple and one apple, how many apples will you have?" Laiq had seen the disappointment on his teacher's face. He calculated again on his fingers. But within him he was also searching for the answer that will make the teacher happy. His search for the answer was not for the correct one, but the one that will make his teacher happy. This time hesitatingly he replied, "Four…"
The disappointment stayed on the teacher's face. She remembered that Laiq liked strawberries. She thought maybe he doesn't like apples and that is making him loose focus. This time with an exaggerated excitement and twinkling in her eyes she asked, "If I give you one strawberry and one strawberry and one strawberry, then how many you will have?" Seeing the teacher happy, young Laiq calculated on his fingers again. There was no pressure on him, but a little on the teacher. She wanted her new approach to succeed. With a hesitating smile young Laiq enquired, "Three?" "When someone gives you an answer that is different from what you expect don't think they are wrong. There maybe an angle that you have not understood at all. You will have to listen and understand, but never listen with a predetermined notion."